ARF | Cats | I'm Amor, Adopt Me! 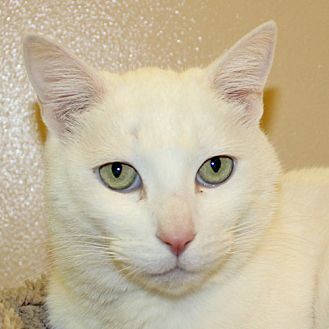 Eight-year-old Amor is a strikingly handsome cat with his snowy white fur. He's not too happy about being in a shelter environment, but whose to blame him. With a lot of love and patience in a quiet home, we feel he'll be a very affectionate cuddly companion. Amor's adoption fee has been prepaid by a generous donor. Amor's adopter must be at least 18 years old with valid-state issued identification. ARF encourages family members to participate in the adoption process, especially children. Please visit ARF's web site for information on adoption and to view more great cats. [description] => Eight-year-old Amor is a strikingly handsome cat with his snowy white fur. He's not too happy about being in a shelter environment, but whose to blame him. With a lot of love and patience in a quiet home, we feel he'll be a very affectionate cuddly companion. Amor's adoption fee has been prepaid by a generous donor.